We had a big day yesterday at Massachusetts Veterinary Referral Hospital in Woburn, MA. We took two of our rescued sea turtles over to this 24-hour emergency/specialty veterinary hospital for CT scans. 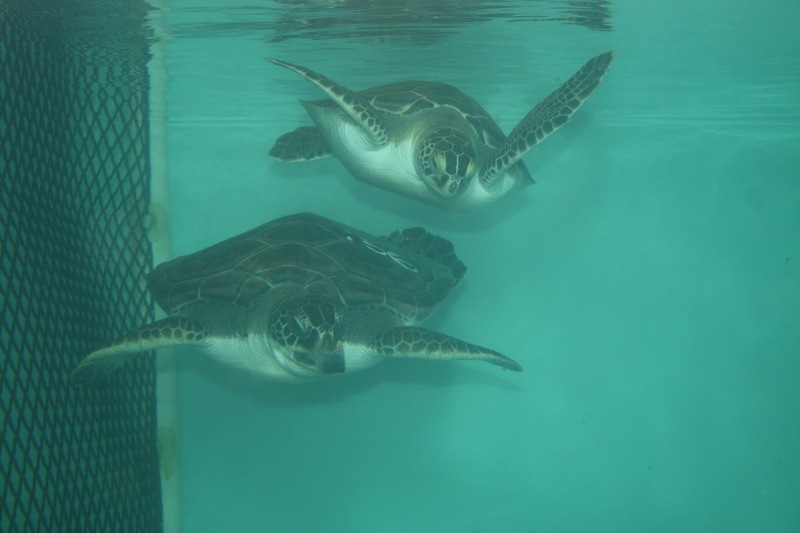 Both these turtles have been chronically sick with severe pneumonia and have not been recovering to our liking. The CT scans produce a detailed 3D image of the lungs, allowing us to isolate the specific areas that are diseased and diagnose or treat the problem more directly. 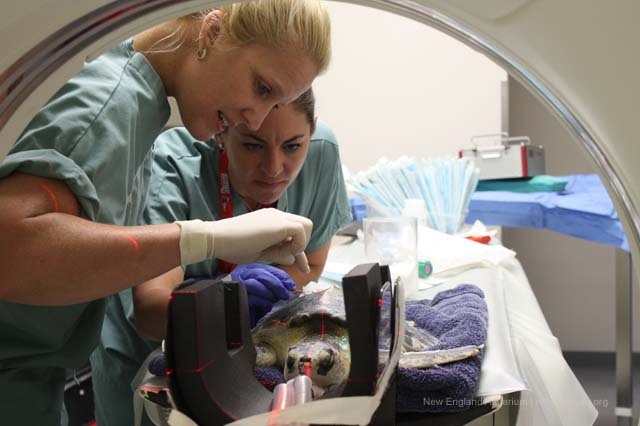 Dr. Jennifer Brisson, A board certified Veterinary Radiologist at Mass Vet checks the turtle before she begins the CT scan. 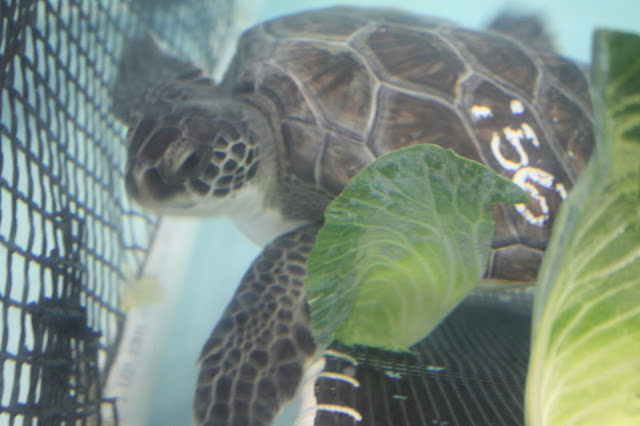 The turtle is under anesthesia so he is resting comfortably. 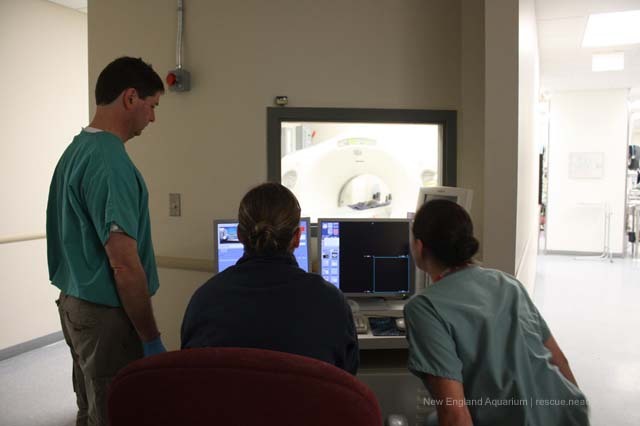 Dr. Innis, Dr. Brisson and certified veterinary technician Kristle Weadick watch the monitors as the CT scan begins. If you look through the window above the computer monitors you can see the scanner and the turtle on the scanning table. 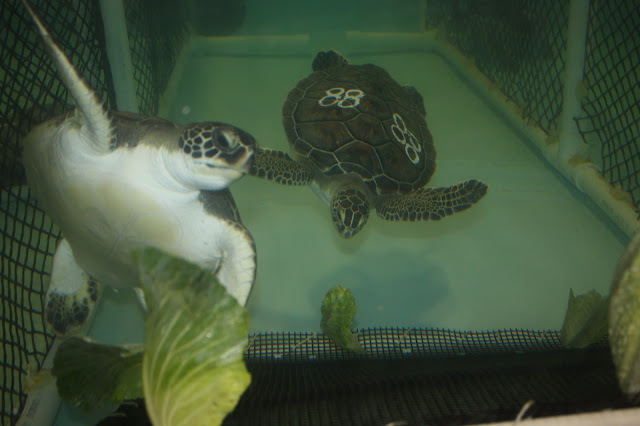 The turtles were under anesthesia for the scan to prevent them from moving around. Motion during the scanning process will blur the images and that defeats the purpose. This way they sleep through the procedure. 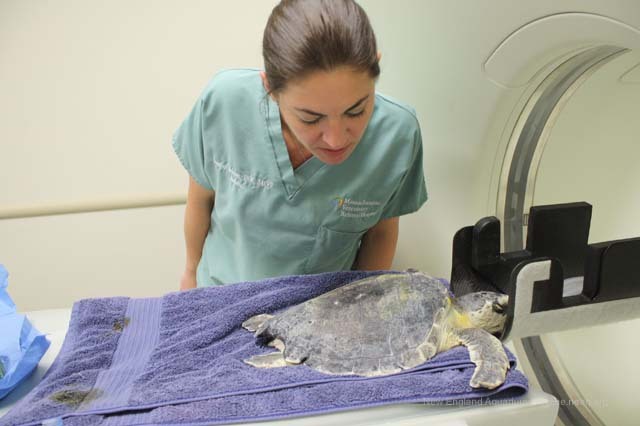 Dr. Innis, the Aquarium's chief of veterinary medicine checks the patient and adjusts the anesthesia before the scan. 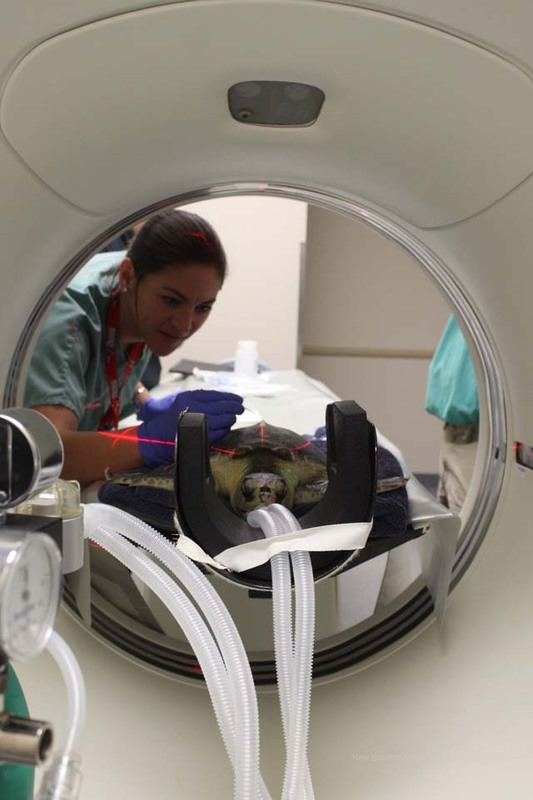 The scans on our second turtle showed a section of lung that concerned the vets. As a result they decided to take a biopsy of the lung to determine the type of infection and allow us to treat accordingly. 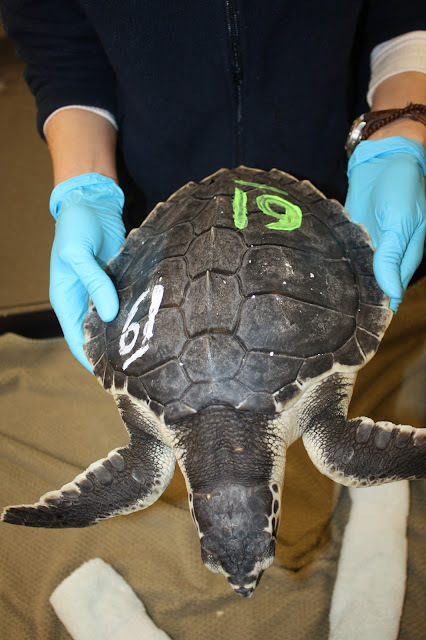 In the photo above, Dr. Brisson marks the spot on the turtle shell, over the site of the lung, where she wants to collect the biopsy. The tubes you see are delivering the anesthesia from the machine to the turtle. At this hospital everyone has a specialty. Mass Vet is a state of the art hospital with advanced surgical and diagnostic tools, as well as highly skilled board certified specialists all on staff and on site. Once the decision to biopsy the lung was made, a few more folks came in to help. Dr. Cara Blake, a board certified veterinary surgeon, came in to work with Dr. Brisson to prepare and perform the biopsy. In the photo above Dr. Blake and Dr. Brisson discuss the biopsy site and prep for the procedure. Our trip to Mass Vet was a huge success. With their generosity and expertise we now have important diagnostic information on our turtles. 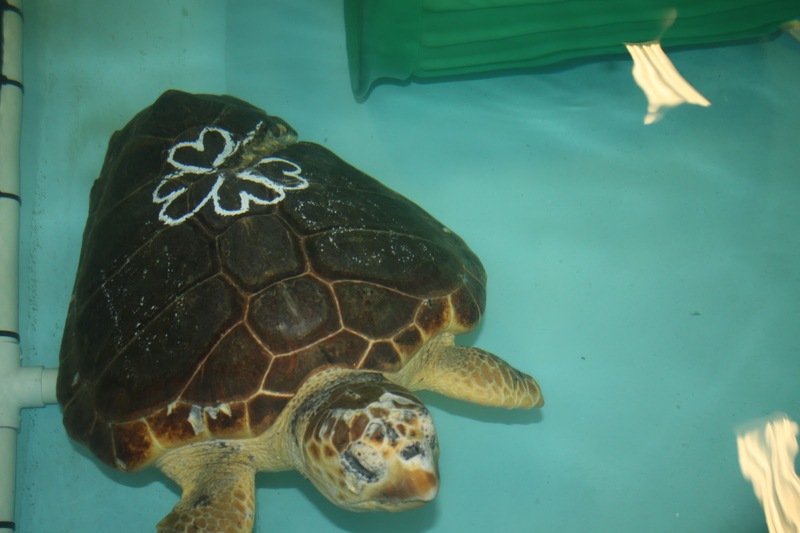 Results from the scans and the biopsy will determine the next course of treatment for these critically endangered sea turtles. I always enjoy going over to work with the great folks at Mass Vet. They constantly have cool procedures going on and sometimes I lose myself in all the excitement of watching these professionals work. 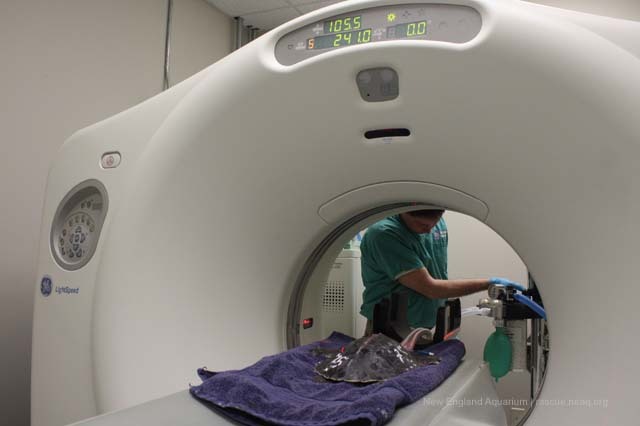 The CT scanner (along with many other high-tech diagnostic tools like an MRI, digital x-ray and ultrasound equipment) is located behind the scenes where there is a persistent flurry of activity, I really love that place! 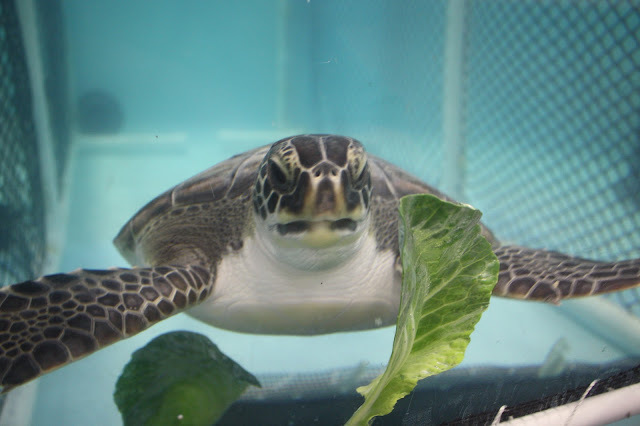 Read Mass Vet's account of this special doctor's visit here. For more information on their services check out their website here or their Facebook page here.